Living Well With Autism - ﻿Does your child have trouble sleeping? ﻿Does your child have trouble sleeping? Children with autism can have trouble sleeping for a number of reasons. They can be more sensitive to light, textures, and noise. Some children with autism have low muscle tone, or other problems, and that can cause breathing disruption or contribute to sleep apnea. And some medications can affect sleep. Sleep problems aren't forever, but you can do lots to help. Let your child get plenty of exercise and sunlight early in the day. Use a visual schedule and stick to a schedule. Don't watch TV or use the computer right before bed. Offer a warm bath or a massage. Don't tickle. That revs up the nervous system. Eat a lighter dinner, light on protein, which is harder to digest. Or eat early and have a light snack before bed. Read a simple story. Some favorites: Goodnight Moon, Giraffes Can't Dance. Create a separate playroom, if possible. Snug-fitting cotton pyjamas; remove tags. Glow in the dark stars on ceiling﻿. Try an air cleaner or humdifier. White noise machines screen out noise. Ask your doctor about adjusting medications. Treat any allergies or sleep apnea (your child can be tested for sleep apnea). 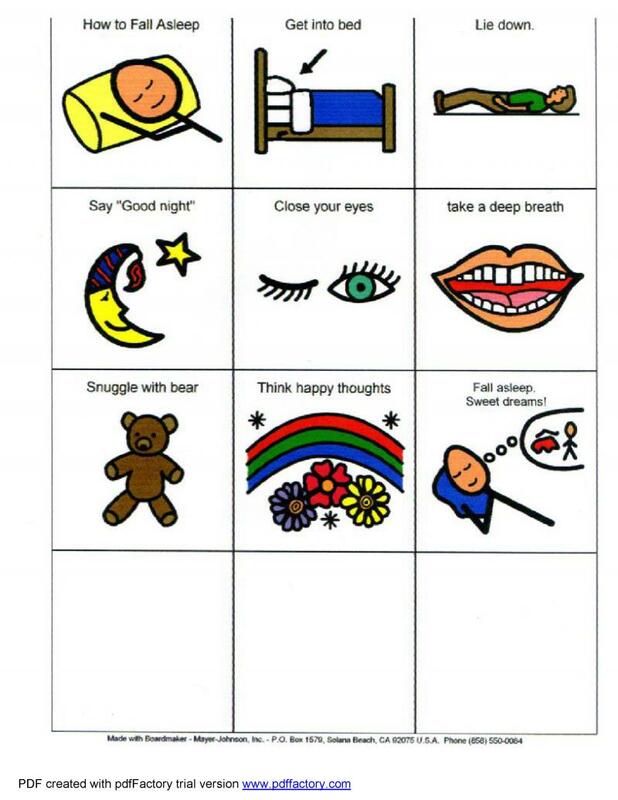 Read: Sleep Better -- A Guide for Improving Sleep for Children with Special Needs. If it’s serious: consult your pediatrician, neurologist, or a sleep disorder clinic﻿. Click here to download the social story. Enlarge on a copier, cut out each image, and make a booklet.